The most comprehensive quantity food production resource on the market. 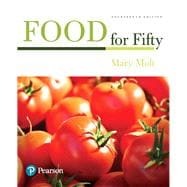 Comprehensive and easy to follow, Food for Fifty provides students and food production professionals with a broad variety of tested quantity recipes, along with valuable tables, charts, and ready-to-use guidelines for preparing and serving quality food in quantity. Author Mary Molt presents the material in an easy-to-use format complete with recipe development information; menu planning guidelines; food safety guidelines; and food product, purchasing, and storage information. First published in 1937, Food for Fifty has been referred to as the bible for quantity food production and recognized as the most comprehensive quantity food production on the market. Designed to function as an invaluable recipe book, a tool for classroom teaching and learning, and a food production resource for commercial kitchens, the book is written with the goal that ideas from culinary publications and the newest recipe books can be produced successfully in quantity by adapting the recipes found in the Food for Fifty. The new edition features approximately 70 new recipes and variations; a full, 4-color design with color photos; updated information related to USDA.gov requirements for K-12 menu development; updated charts and tables; an expanded menu planning section, and more. Mary Molt, Ph.D., R.D., L.D., is Associate Director Housing and Dining Services and Assistant Professor Food, Nutrition, Dietetics, Health at Kansas State University. She earned her BS from the University of Nebraska-Kearney, MS from Oklahoma State University, and PhD from Kansas State University (KSU). Dr. Molt has for worked 43 years at KSU on a joint appointment in foodservice management in Housing and Dining Services and as a faculty member in the College of Human Ecology teaching food management related classes. Publically recognized for foodservice management leadership, she has received several prestigious awards: National Association of College and University Foodservice (NACUFS) Theodore W. Minah Award, the highest honor given for exceptional contributions to the foodservice industry (1995); twice the NACUFS Richard Lichtenfelt Award for outstanding service to the association; Academy of Nutrition and Dietetics (AND) Excellence in the Practice of Management (1997); and Medallion Award in recognition of outstanding service and leadership to the Academy and the dietetics profession (2013); International Food and Equipment Manufacturers (IFMA) Silver and Gold Plates recognizing exceptional accomplishments and legendary status in the foodservice industry (2012). She is a Kansas State University Faculty Fellow (2014).